Cigarette smoking is the leading cause of preventable disease and death in the United States, accounting for more than 480,000 deaths every year, or 1 of every 5 deaths. Nearly 80 percent of all adult smokers begin smoking by age 18; and 90 percent do so before leaving their teens. With the rise of alternate forms of tobacco (e-cigarettes, hookah, etc.) tobacco continues to be a large public health concern. 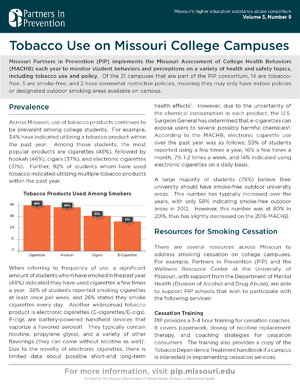 Compiled here are resources to address tobacco use among college students. Electronic cigarettes (known as e-cigarettes, vapes, etc.) are electronic nicotine delivery systems that use battery packs to convert liquid nicotine into a mist or vapor that is inhaled. E-cigarette use is popular among teens and are now the most commonly used for of tobacco among youth in the U.S. (NIDA). E-cigarette use is viewed as less harmful than traditional tobacco products and due to targeted marketing, flavored liquids, and availability, they are very appealing to this age group. 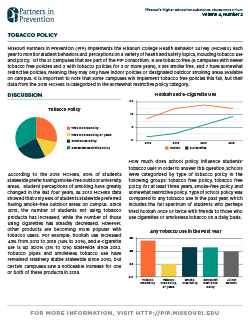 E-cigarette use may serve as an introductory product for youth and is associated with an increased likelihood in use of other tobacco products. The health risks of e-cigarette use include addiction, as nicotine is highly addictive. Use of e-cigarettes also involves heating chemicals and metal before inhaling and the vapor has been shown to contain carcinogens (cancer causing substance) and other toxic chemicals which impact lung health. Use during youth can also impact brain development, attention, learning, mood, and impulse control. JUULs are one type of electronic cigarette that are becoming increasingly popular among youth. JUULs resemble a USB drive, can be charged in a USB port and emit little to no detectable vapor. 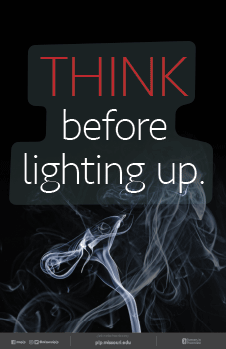 JUUL pods contain as much nicotine as a pack of cigarettes and deliver nicotine more quickly and at higher doses than other e-cigarettes, which can increase the risk of addiction. 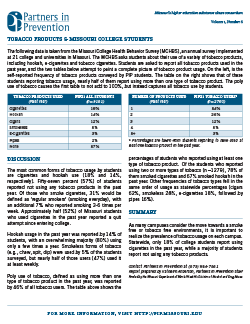 The CDC has a great guide on best practices for comprehensive tobacco control programs. 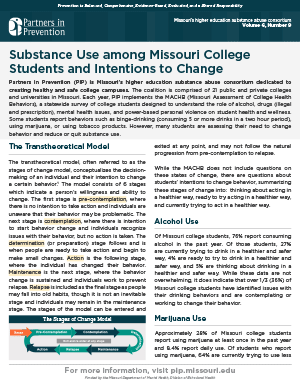 Tobacco Free College Campus Initiative has a wealth of resources for campuses to create policies, encourage compliance and enforcement, and more! 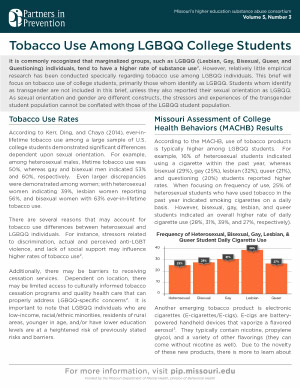 The Adolescent Smoking Cessation: Escaping Nicotine and Tobacco Program (ASCENT) program is listed in SAMHSA’s National Registry of Evidence-based Programs and Practices as having effective outcomes for tobacco use. Stanford Medicine has a great online Tobacco Prevention Toolkit with lots of great information about evidence based tobacco use prevention.